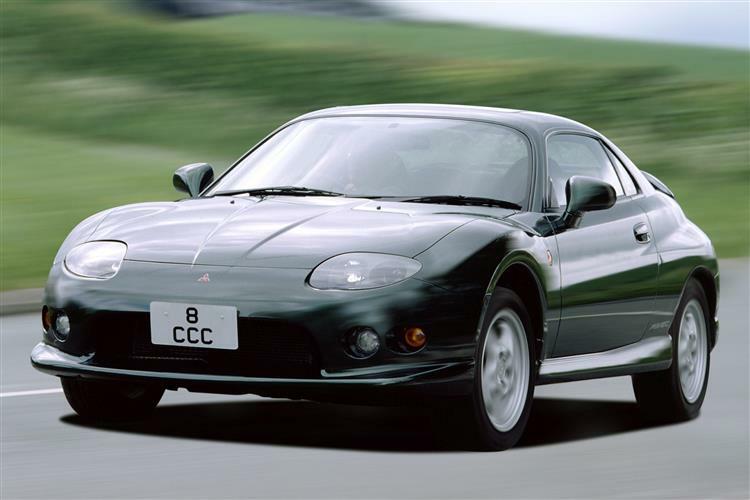 The Mitsubishi FTO is something of a symbol of UK buyer power. With Mitsubishi refusing to give the car an official UK launch, coupe buyers voted with their wallets and made the 'Fresh Touring Origination' the top selling Japanese import. Offering purposeful styling, razor-sharp handling and a range of high-tech engines, the FTO became the totem of the 'Gran Turismo' generation. Tracking down a used example is simplicity itself. Finding an honest one may well take a little more endeavour. Launched in Japan in 1994, the Mitsubishi FTO became the first sports car to win the coveted Japanese Car Of The Year award since the MK 1 Toyota MR2 in 1984. Based on a modified Mitsubishi Galant platform, the FTO was offered with three engines, a 1.8-litre 16v four-cylinder unit developing 125bhp, a 2.0-litre V6 developing 180bhp and a MIVEC (Mitsubishi Innovative Valve Timing and lift Electronic Control system) version of the V6 which utilised variable valve timing in order to generate 200bhp. Six models are available as imports. The 1.8-litre GS is the base model, whilst the GR is similar except for the fitment of the 180bhp 2.0-litre V6. The GX Sport is a GR with bigger alloy wheels, better brakes and an aggressive spoiler kit. The most popular model was the GPX, which used the 200bhp MIVEC V6, but was outwardly similar to the GX Sport. Two lesser-known versions are the GX Aero, which opted for a more aggressive spoiler kit, and the specialist GP version R, which is a lighter, stiffer version of the GPX. A GPX Type-R if you will. 'Intelligent' four speed INVECS II automatic gearboxes could be specified, with five-speed auto boxes available from 1997, when the FTO range received a mild facelift. The indicators and front foglamps were now mounted in separate housings whilst the 'mouth' at the front of the car was changed from an ovoid shape to a more rectangular appearance. Originally only intended for the Japanese market, official imports to New Zealand began in 1998 and whilst a few cars were reaching these shores via the 'semi-official' route of Mitsubishi's Ralliart arm, it wasn't until May 2000 that the FTO GPX got the official thumbs up from Mitsubishi UK, priced at £22,995. With over 20,000 grey imported FTOs having already arrived, Mitsubishi may just have missed the boat, so as to speak. Even if the FTO were a dog to drive, which it most certainly isn't, its popularity would be guaranteed by its rakish styling. With muscular front wheel arches that bust gently through the line of the front wing and a beautifully proportioned wedge shape, the FTO is unashamedly pretty. Compared to the Mitsubishi, a Hyundai Coupe or a Toyota Celica appear awkward, misshapen and lugubrious. From the front the squinting headlamps and purposeful maw of the air intake give the car genuine overtaking presence - you could easily mistake it for a Jaguar XK8 arriving in your mirror. Opt for a Japanese import and it's quite a lottery which level of equipment you'll end up with. Mitsubishi pursued a menu-pricing policy with the FTO, offering basic cars with huge, although reasonably priced, option lists. Expect to find ABS, electrically folding door mirrors, manual air conditioning, a drivers airbag, tilt adjustable power steering and central/remote door locking on most models bar the base 1.8. UK-spec FTO GPX models were fitted with fully automatic air conditioning, a leather rimmed steering wheel and low-profile 205/50R16 tyres. The interior singularly fails to live up to the visual drama of the FTO's exterior, being probably its weakest aspect. There's quite a large amount of low quality early nineties style plastic on display, and it is this more than anything else that dates the FTO. Take care when inspecting grey import FTOs. Ensure that the car has been SVA tested- if not negotiate at least a £500 discount. The modifications required for SVA testing are fairly straightforward. Getting your speedometer converted (kmh to mph) shouldn't be difficult, and several companies can take care of headlight adjustment, fitting restrictor necks inside the fuel fillers to allow only unleaded fuel and the fitting of rear fog lights. You might need a band expander to plug between the radio and aerial if the appeal of Radio 2 begins to pall, as Japanese radios operate on a different band of frequencies to ours. Make sure the 112mph speed restrictor is removed and also check the speed rating of the tyres. Due to the speed limiter, many Japanese cars have cheaper Q rated tyres that will need replacing with at least V rated rubber. Exhausts so large you need to check them for tramps in the morning are also a Japanese favourite, and these may exceed SVA noise regulations. Dinky wing mirrors will also earn you a fail. Watch out for the sharp practice of importers sticking a new mph face on the existing kmh speedometer. Chances are they will have left the odometer unchanged, therefore clocking up a mile for every kilometre the car is driven. Official UK FTOs were offered with a three year unlimited mileage warranty, three year anti corrosion perforation warranty and comprehensive product liability provision, hence going some way to justifying the additional cost. FTO-specific problems include faulty central locking, warped brake discs, a flyweight standard-fit battery, less than bulletproof air conditioning and failing window guides resulting in rattly glass. Hard-driven FTOs sometimes give a knocking sound over bumps due to worn anti-roll bar bushes, and dirty idle control valves and sensors can make idling a bit lumpy but by and large the car is surprisingly reliable for such a complex piece of kit. Beware of owners of 180bhp cars trying to pass them off as MIVEC models. You can tell the engines apart by the location of the oil filler. It's mounted on the right of the transverse engine on a 180bhp V6 and on the left on a MIVEC V6. Also the second last letter of your car's chassis number will be a G for a MIVEC GPX and a U or an H for GS or GR models. Cam belts need changing every 50,000 miles, and fuel filters need replacing every 60,000 miles. Make sure the car has been undersealed, as the harsh British winter will reduce an unprotected FTO's belly and chassis legs to a rusty mess in no time. FTOs should be run on a diet of synthetic engine oil and most will benefit from super-unleaded fuel. In case you were wondering what the two plastic loops in the passenger footwell were for, they were used to house distress flares required by Japanese law in the event of a breakdown! (Approximate prices, based on a 2000 FTO V6) Picked up a bargain FTO? Before you blow what you saved on a dream holiday in Fuengirola or some attractive uPVC glazing, squirrel some away to cover spares. After all, should you require a new exhaust system the £800 you'll need to cover it will have the family looking at a weekend's B&B this summer in Clacton instead of the Costas. A replacement headlamp is a steepish £350, with a starter motor weighing in at £361. An alternator is a reasonable £195, whilst front brake pads are £45 and rears a pricey £80. A clutch kit should work out at £200. Despite the growing number on Britain's roads, the FTO is still quite a specialist proposition, although laws of economics dictate that prices should fall. The Mitsubishi FTO GPX is a deceptive car. With 200bhp under its bonnet and a just 1200kg to haul about, you'd expect it to feel extremely quick, which makes it all the more puzzling when it doesn't. You may find yourself checking the handbrake or trying to remember what grade of fuel the owner last filled up with. The figures look reasonable enough, with 60mph arriving in 7.3 seconds and a top speed the far side of 130mph, but there's a genuine lack of drama in the way the FTO reaches them. Whether as a result of the benign front-wheel drive chassis, the near linear power delivery, the muted engine note or the supple suspension, it's only when you check the speedometer or wonder why other road users have suddenly metamorphosed into pondering geriatrics that you realise that the FTO isn't slow at all. It just makes the business of driving quickly extremely fluid, taking much of the effort out of hustling it along, in effect massaging the driver's confidence. With peak power reached at 7500 rpm, suspicions that the FTO is a screamer rather than a lugger are confirmed, although what is transmitted to the car's interior is a muted yowl. The five-speed manual box is a delight, but the INVECS-II five-speed automatic is a fascinating piece of equipment. You'll feel it trying to second-guess you as you pull away, working out if you're in the mood to hold a gear or lazily slop up early. It recognises the difference between hills and flat roads, and should the driver so wish, a Tiptronic-style mode can be engaged whereby gears can be manually selected. If the gearbox didn't extract such a performance penalty (rest to 60 in 9.1 seconds) it would be a thing of wonderment. Nonetheless, approximately 70% of all UK FTO models are fitted with it. One big demerit on the FTO's dynamic report card concerns the brakes. With 10.8-inch discs fitted to the GPX, braking performance is in the Nissan Micra league. One of the first modifications many FTO owners make is to fit grooved and drilled front discs to beef up stopping power. As a cheap, modern coupe, the Mitsubishi FTO has few rivals. Unlike the first importers, you won't be buying a whole lot of exclusivity as word has well and truly got out regarding the FTO's qualities. As long as you're aware of the difference between buying and running official UK cars and Japanese import models, then you shouldn't come a cropper. Don't think your low mileage import FTO is worth a lot more than you paid for it, because it's definitely a buyer's market, and there are no shortage of cheap FTOs washing round the system. As such, you can afford to take your time, be picky and buy the best you see. If the driving experience doesn't put a smile on your face, the thought of what you could have bought with what you spent on your FTO certainly will.